I rarely drank coffee until the age of fifty. 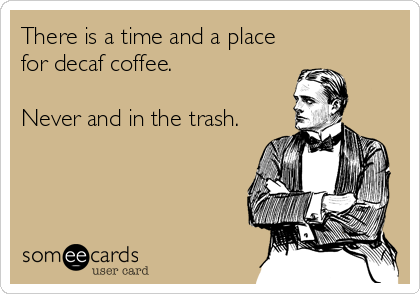 After that, I usually drank decaf. Recently I've discovered a real benefit to having a strong cup of caffeinated coffee before a long bike ride, and another halfway through. Then I discovered that I enjoyed Bowflexing more after coffee, and seemed to be able to "lift" more. Lots of things, I find, are better after coffee. I realize that some of this is not clearcut, and there may be a placebo thing involved, but I want to make the most of it. So, recognizing that there is a tolerance effect, how can I adjust my caffeine consumption to get the most bang for my buck? For example, if I have a caf coffee every day, how much will I be blunting the effect for bike rides? I don't have a medical background, but as the caffeine seems to be considered a "drug", I would think you'd get more bang for the buck if you only take it for the bike rides. If you start taking it every day, eventually, you might find you need more to help with your exercising. You have the right idea...use it to advance a personal cause. I started drinking it at w*rk because otherwise I didn't get a break and didn't get to socialize. Then megacorp got the benefit when I could lift more, hehe! I quit because I got headaches if I didn't have it (coffee). I hated to drag out the coffee maker on weekends just to feed my addiction. I just quit a daily tea habit (unlike coffee, I had no withdrawl symptoms) so that I could nap better!! Back when I was a very active runner, the conventional wisdom among us was that coffee had a positive effect on performance. I believe that is still true, and they continue to find new benefits from coffee drinking. As for dosage and timing, the optimal effect seemed to be two cups, completed about two hours before a race. I don't have any authoritative references for that, but it has always worked for me. If you want the optimal 'kick' from caffeine, use it sparingly. Daily use will definitely blunt the effect. As a two cup per day caffeinated coffee drinker, I did the following experiment - no caffeine from any source for six months. Add caffeine, go for a ride - . Wow!, rocket fuel. Unfortunately, the boost tapers quickly with regular consumption. One cup high test per day, necessary and sufficient. Are you trying to establish a new land speed record? Sorry no data or links. But my personal experience is that it helps me to keep a good edge by drinking about 3 cups (by measure) in the morning before taking off on my runs. It also helps in the laxative department as I don't want to get out in the hills and suddenly have unpleasant urges. I do think that it's important to hydrate properly all during the day. For me this means a glass of water in the morning, after the run, and around 2pm. This is in addition to the milk and coffee in the morning, coke at lunch and wine with dinner, plus milk at night. If I don't hydrate I get a mild headache. As a long time caffeinated coffee drinker, I'm locked in at one to three 8 ounce mugs per day. Almost no noticeable "boost" from it (like there was years ago) but it does something for me psychologically, sort of a maintenance dose for the caffeine-addicted. If I drink more than 3 mugs, I'll just get tired. For a non-habituated caffeine user, the typical effect would be a sense of well-being and enhanced mental acuity and quickness, and a desire to get going at that bike-training regimen. Caffeine is found in many painkillers such as aspirin and acetaminophen because it enhances the effect of these medicines. On its own, caffeine can reduce post-workout soreness. Research found that “moderate” doses of caffeine in two cups of coffee can have this beneficial effect. Tip: Drink 2 cups of coffee a day. I also remember reading recently (sorry, can't find the reference) about a study where they found coffee consumption before hard physical activity induced the participants to burn 30% more calories for several hours after the exercise, compared to the placebo group. Caffeine may give an extra energy boost but for me at least it also seems to make me urinate more frequently which can be an inconvenience on bike rides and may make it more difficult to stay properly hydrated. I have a single ~12 oz serving each morning and it seems to wake me up pretty good, get me going and excited about things. It's usually after my 1 mile morning walk though. I've heard coffee has positive health benefits in moderation, and I enjoy the flavor of it also. Seems like a good habit. The main side effect seems to be teeth staining (per my dental hygienist) and sometimes mild headaches if I skip the coffee. Al, your idea on dosing before big activity makes sense, and skipping it the rest of the time. I imagine you get used to caffeine after routine consumption. I certainly notice a buzz more when I skip it for a day or two. Exactly the same regiment as me. I do two cups in morning 8-10am then one more in afternoon 3-5pm. Drink plenty of water too. No/limited caffeine for me, sets off my a-fib, folks may find this issue arising as they get older and (surprisingly!) some correlation with exercise as well. Now I've become an expert on decaff coffee, still love the flavor and socialization. Pepsico has recently applied to patent a series of Chinese herbal extracts that promise to give a boost without the negative side effects of caffeine. I am reminded of Alexi Grewals 1984 Olympic Gold Metal (first American) that was nearly thwarted when he tested positive for ephedra (ma Huang) in the early season. It can also matter if your genetically a fast caffeine metabolizer or slow metabolizer. I'm in a mixed marriage - I'm fast, he's slow. So coffee gives him the jitters if he crosses a threshold, and I've never had my sleep disturbed by too much coffee. (And I've been known to drink a lot.) This was one of the tidbits 23andMe used to give (health trait). If you did 23andMe after the FDA shut down the health info, you can still access your raw info by looking at your results for the specific marker. Basically - for me coffee is good, for my husband, it increases his heart risk if he uses too much.